Bathing with locals in Budapest. At least suits are mandatory this time. When we initially decided to go to the bathhouses in Budapest, I had not so pleasant flashbacks of our onsen experience in Japan. Needless to say, we were both hesitant to strip down naked and bathe in front of total strangers. Thankfully, we did not run into that issue here in Budapest. Suits are mandatory. Phew! 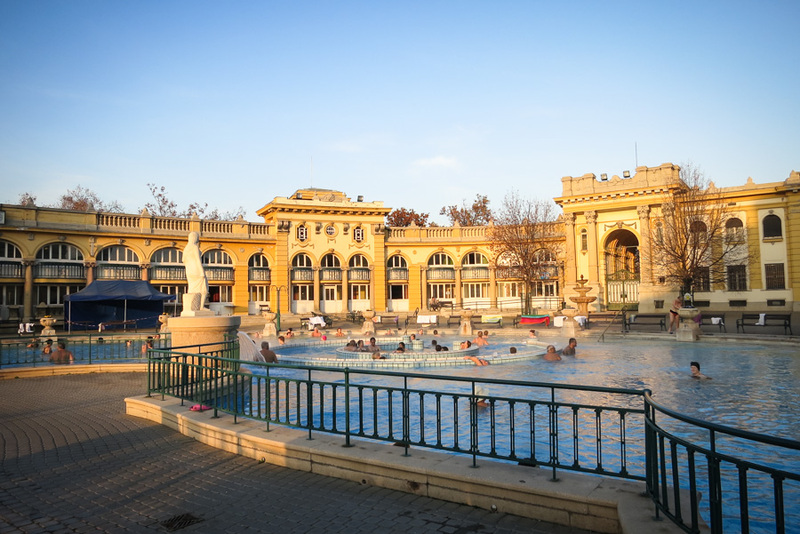 Hot thermal spas in baroque-style baths on a cold winter’s day.. can you think of a better way to spend the afternoon in Budapest? Didn’t think so. This is the reason why we packed our swimwear for a winter in eastern Europe. That, and our flip flops. 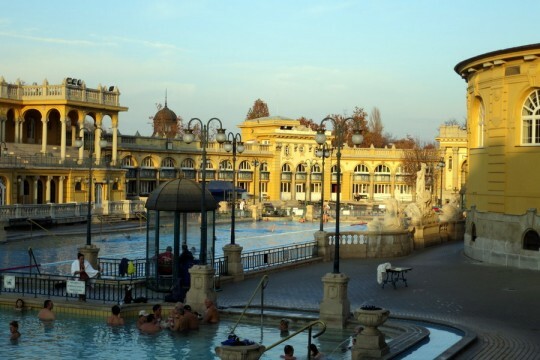 We decided to have a day of relaxation and visited the Szechenyi Baths and Spa because we read it was cheaper and less crowded. 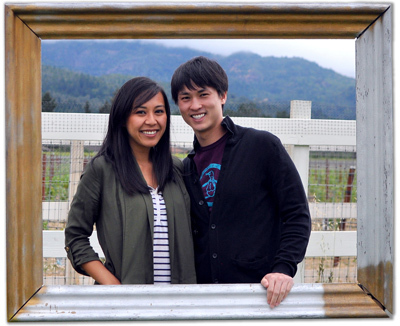 Thanks to traveling off-season, we weren’t smushed like sardines. 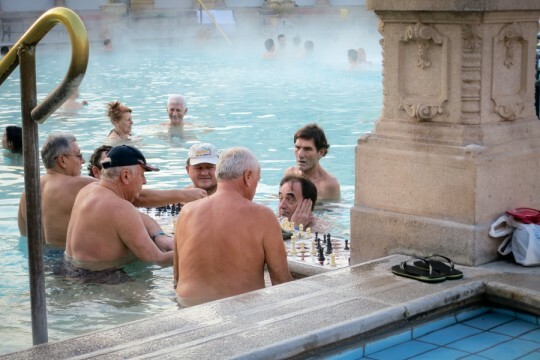 Just a few locals in their speedos playing chess, hardly anything to be uncomfortable about. There are a total of 15 pools with larger pools outdoor, smaller group size ones indoor. Water temperature range both hot and cold from 26-38*C. After having spent time in the hot springs of New Zealand and Japan with water temperatures as high as 42*C, the Szechenyi pools were just not hot enough for our liking. But it did the trick to relax our muscles and ease our minds. 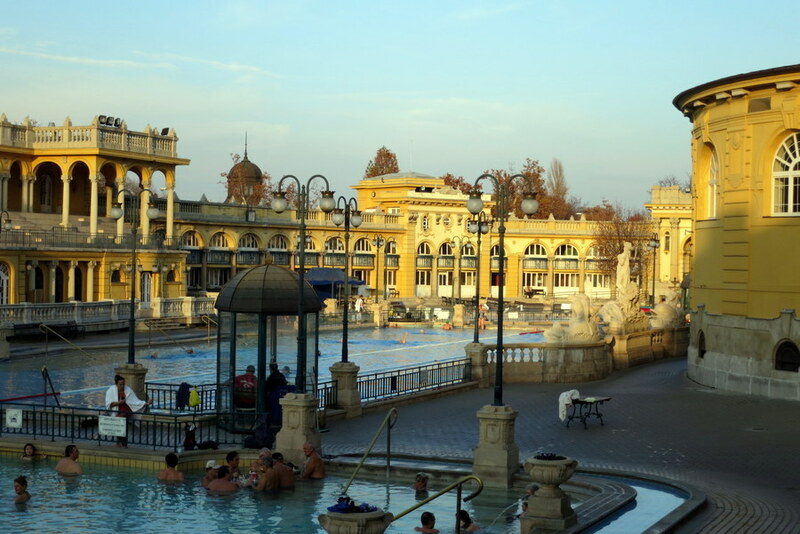 We spent the recommended 20 minutes at the thermal “sitting pool” outdoor before switching to the “whirlpool” – by far our favorite of all pools. Gerard got a kick out of the massaging water beam where streams of water would shoot out at his back. And we both had loads of fun spinning in the giant human whirlpool at times going in circles minutes on end screaming wheee! the entire time, it was so much fun. We could have stayed all day but we wanted to check out the indoor pools also. Three hours later, we dragged our prune-y limbs out of the baths and reluctantly headed home. It’s been months, possibly the entire year, since I’ve been this relaxed. I’m sure Gerard would agree, our bodies have taken a toll from a year of constant travel. 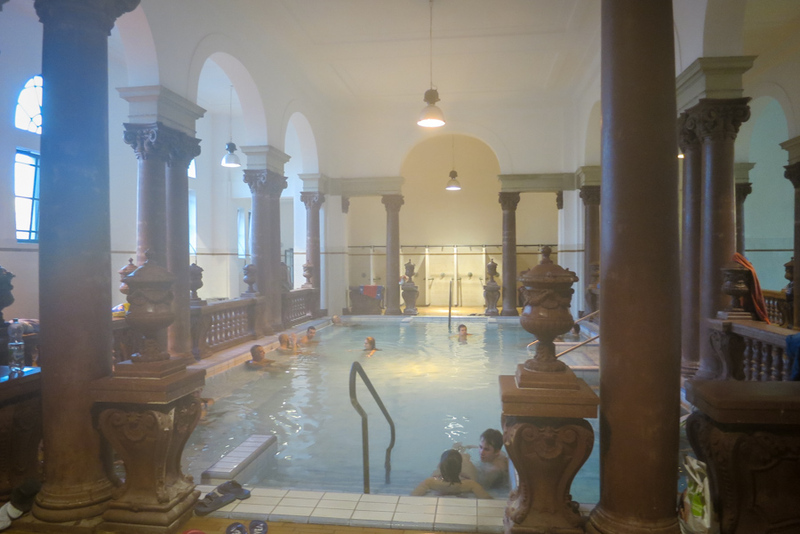 The baths, especially on a chilly day, was exactly what we needed. 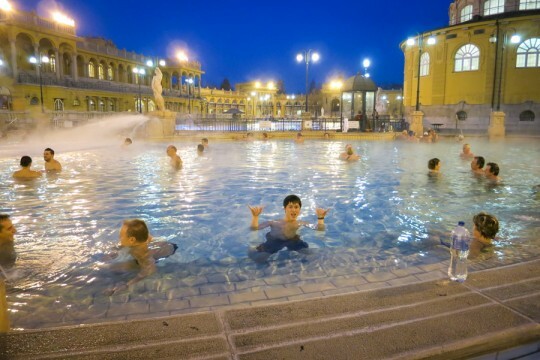 Would you soak it up at the baths in Budapest? 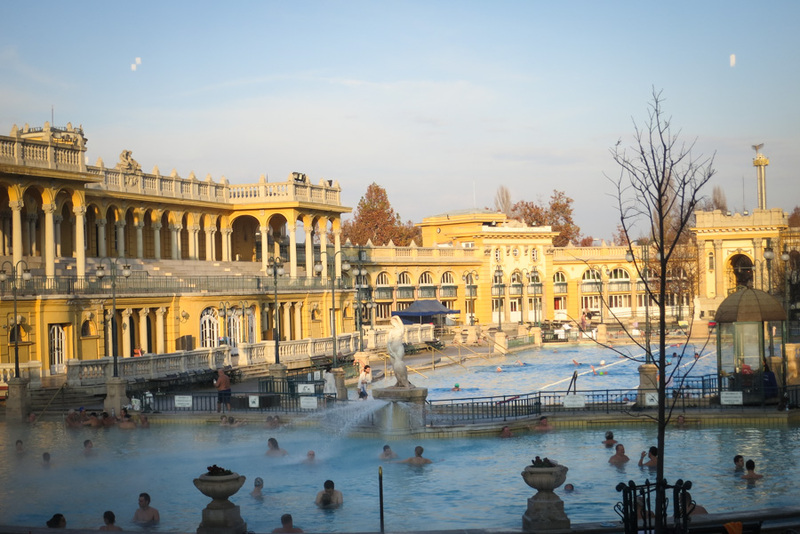 Our trip to Eastern Europe was made possible by the awesome folks at Eurail.com. Travel Europe this winter by train, book now for great winter savings. hubs need to man up! lol, just kidding.. I am so there. I love thermal baths. The feeling of relaxation outweighs the creepy factor. I think I totally would try it! Looked actually quite good! That looks phenomenal! But I don’t know I could stay for 3 hours! More reasons for me to head to Budapest. These baths look incredible! I wish we had more days, I would have gone everyday to different bath houses.. wish we had those here. 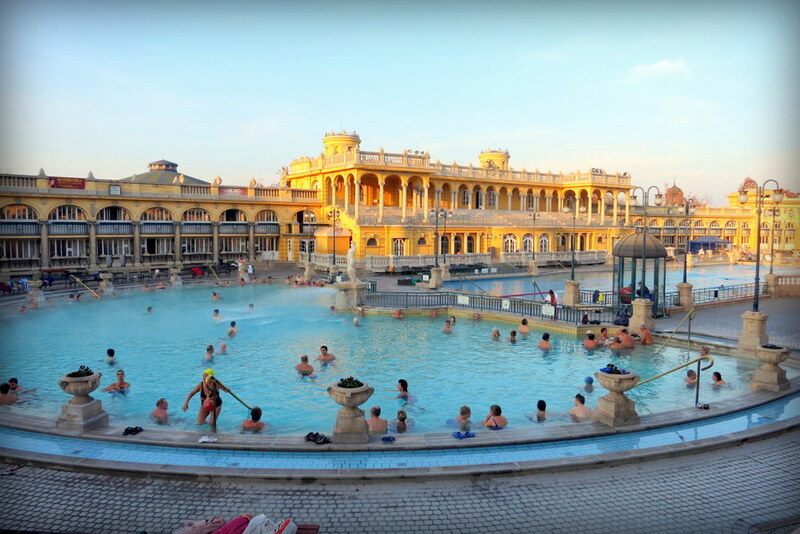 I went to the Szechenyi Baths and it was such an amazing experience. It’s inexpensive (by Western standards – got a massage for $12! ), it’s unique, and it’s relaxing. I went in the dead of winter, with snow on the ground, but the springs outside were still hot and soothing. You can spend all day in this spa but if you only want to stay for a few hours, they’ll give you a refund at the end for the time unused! Nice! Oh, I wish I knew about the spa and refund thing.. boo! Next time for sure. Thanks for the tip! That looks so fun! We’ll definitely add this to the list of things to do! Thx for sharing!